In 1970, Harold Swanson joined The Prairie School as a social studies instructor and head tennis coach. For over four decades since that time he’s nurtured, mentored and guided hundreds of students to not only become remarkable athletes, but to pursue their academic endeavors with determination and pride. Coach Swanson brings honesty and integrity — or, as Swanny says, “A touch of class” — to the both the game of tennis and to life. With his positive outlook and ability to find teachable moments in every aspect of his day, Harold is a great leader and an example to student-athletes across generations. Upon his arrival in 1970, Harold launched both the Boys’ and Girls’ Tennis programs; today, he continues to serve as Head Coach and is responsible having led teams to six State Championships and individual athletes to over fifty State recognitions. One of his past players, Jud Shaufler ‘75, won three WISAA State Championships and a second, Zane Navratil ‘14, won three WIAA Division II Individual State Championships. In 1970 Swanny also developed a summer camp that continues to draw aspiring players from the Racine community to Prairie’s courts. In 2013, Harold was recognized as the Division II Coach of the Year by the Wisconsin Tennis Coaches’ Association — a distinction conferred by his peers. In 2014, he was bestowed the additional honor of being inducted into the Wisconsin Tennis Coaches’ Hall of Fame. Swanny’s love of tennis is equal to his passion for working with students. For forty-six years, Harold served as a Middle School social studies teacher at Prairie. 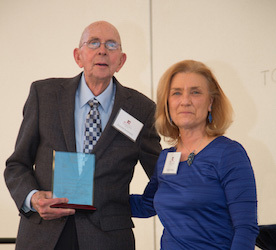 Before retiring from the classroom in 2001, he demonstrated tremendous patience and commitment, individualizing his approach to learning by organizing after-school study sessions and developing games to help students prepare for exams. Harold and his wife, Kathryn, enrolled their three children at Prairie — Erik ‘87, Thor ‘83 and Kristen ‘81 — beginning with Early School. Still very much a part of the school community, Swanny is loved by all.